There is no doubt that the Oculus Rift VR headset, with its 3D display and tilt sensors, is designed for gaming. But that's not all it can do. There are several apps that allow you to watch movies on it as well. Some of these apps simulate the theater experience, complete with rows of seating and a giant screen on the wall in front of you—not to mention the use of the tilt sensors to emulate your head's movement. But for me, all I wanted was for the movie to be floating in the blackness in front of me—with no fancy tilt controls or anything else. VR Player fit the bill. 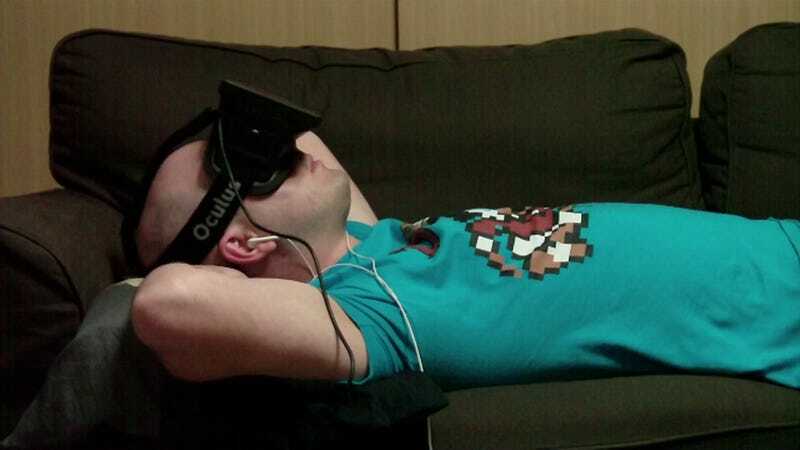 And not only is it capable of taking a 2D movie and projecting it into the Oculus Rift, it works with 3D movies, too. After plugging in my headphones and lying down on my couch, I started with the animated feature My Little Pony: Equestria Girls. During close-ups it looked fine, but anytime there was a wide shot with lots of details—or worse yet a wide shot with lots of details plus movement—the Rift's inherent problem showed through: Because each of your eyes is looking at the equivalent of a 600x400 pixel screen two inches away from your face, it looks more than a little blocky. When I moved on to my second movie, the Tom Cruise sci-fi film Oblivion, it got even worse. As a live action movie, it was generally more detailed than an animated one—not that I'd know that from the Rift. Details in wide shots were practically non-existent—especially in the case of faces. This in turn caused me to miss out on some of the film's most important reveals (until, at least, the film's next close-up clarified what was going on). Also, due to the pixelation, reading anything was this side of impossible. Lastly, I tried out Avatar in 3D. On the whole it shared the same pixelation problems as the other two movies. And as for the 3D effect, while it was noticeable, it seemed to have less "pop" than when watching films in the theater with 3D glasses. To tell the truth, I wasn't able to watch all three films in one go. After watching the first two films, I had to take a break from using the Rift and return to the real world. While it wasn't crippling or anything, I was in pain. Despite the Rift's less than a pound of weight, my sinuses, where the Rift had been resting, ached. More than that, though, my head and eyes hurt. Much like when playing games on the Rift for long periods, your eyes start straining. Your eyes know what you're seeing should be clearer, so they try to bring the video into sharper focus automatically. All this does, though, is reveal the pixel boxes. So after feeling the effects of several hours of this, I chose not to watch Avatar until the following day. So, to sum it all up, what is it like to watch movies on the Rift? Like watching movies on the world's biggest standard definition CRT TV. The screen looks huge and so do the pixels. Still, it is nice to be able to just lie down on your back and watch a movie.